This week I’m off to the International Food Blogger’s Conference in California! I am so excited to spend some time with other food bloggers and, of course, I can’t wait to try all the delicious food. The conference starts with an excursion to check out wines too. So excited. 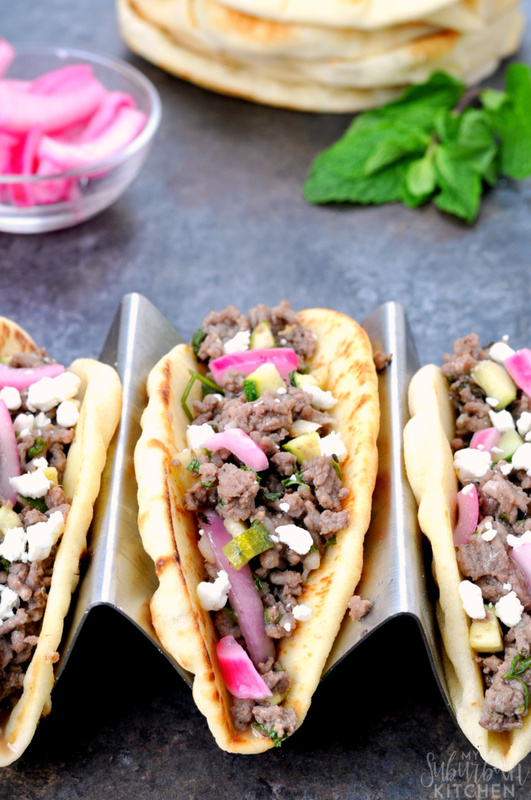 Part of my travel prep always includes making sure there are good options for dinner, like these gingered beef flatbread tacos, at home. The great thing about these is that you can easily make all the components ahead of time and then put them together when you are ready to eat them. 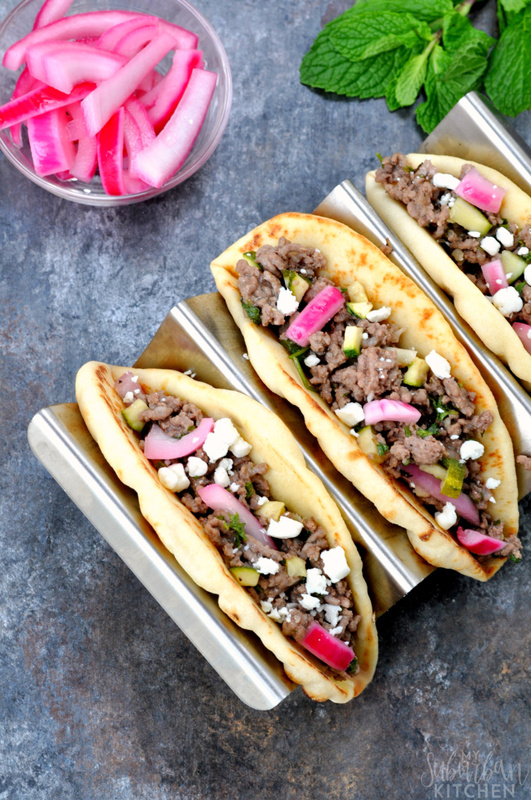 Plus, who doesn’t love pickled red onions?! 1. In a medium glass bowl, combine sliced onions, pepper and 1 cup rice vinegar. Refrigerate for at least one hour. 2. Heat a large skillet over medium heat. Add ground beef. Season with salt and pepper. Cook, stirring to crumble, until browned. Drain and return to pan. 3. Add garlic, ginger, fish sauce and pickling liquid. Cook for 1-2 minutes. Stir in zucchini and cook for an additional 2-3 minutes. 4. Remove from heat and stir in pickled onions, cucumber, mint and parsley. 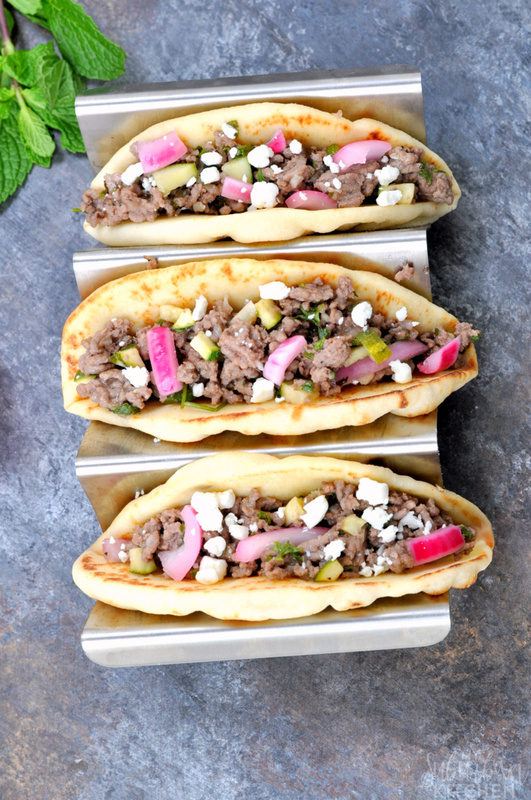 Divide between flatbreads and top with crumbled feta. If you want to make this ahead of time. Complete steps 1-3. When ready to heat, reheat beef mixture and then complete remaining step. This has become one of my new favorite meals to make! I can’t wait to hear what my parents think after they try it this week. In a medium glass bowl, combine sliced onions, pepper and 1 cup rice vinegar. Refrigerate for at least one hour. Heat a large skillet over medium heat. Add ground beef. Season with salt and pepper. Cook, stirring to crumble, until browned. Drain and return to pan. Add garlic, ginger, fish sauce and pickling liquid. Cook for 1-2 minutes. Stir in zucchini and cook for an additional 2-3 minutes. Remove from heat and stir in pickled onions, cucumber, mint and parsley. 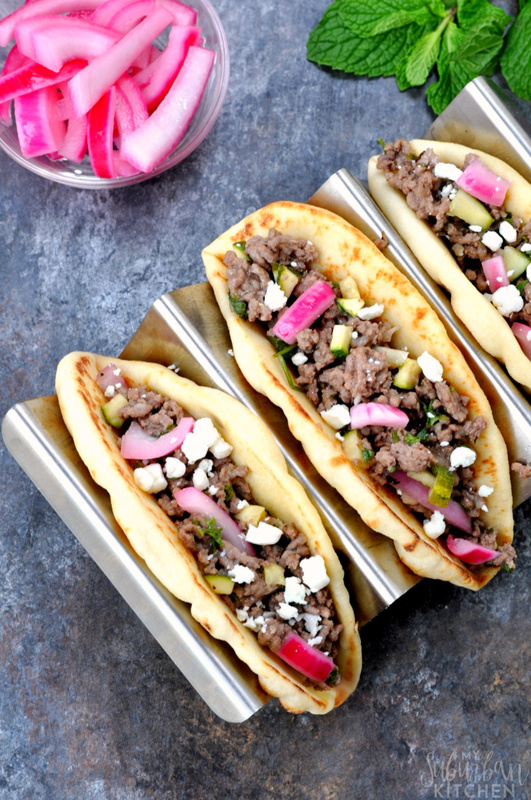 Divide between flatbreads and top with crumbled feta.